This customers residence is located in Berkeley CA, our customer came to us with concerns regarding settling issues with his foundation. Through quick research they found us and set an appointment with our appointment center. Our strutcual consultant Daniel, quickly came to evaluate their situation. This customers home has settling and cracking issues in the perimeter foundation and interior walls with downhill settlement over -2 inches on left side and rear of property with some lateral movement in the structure. 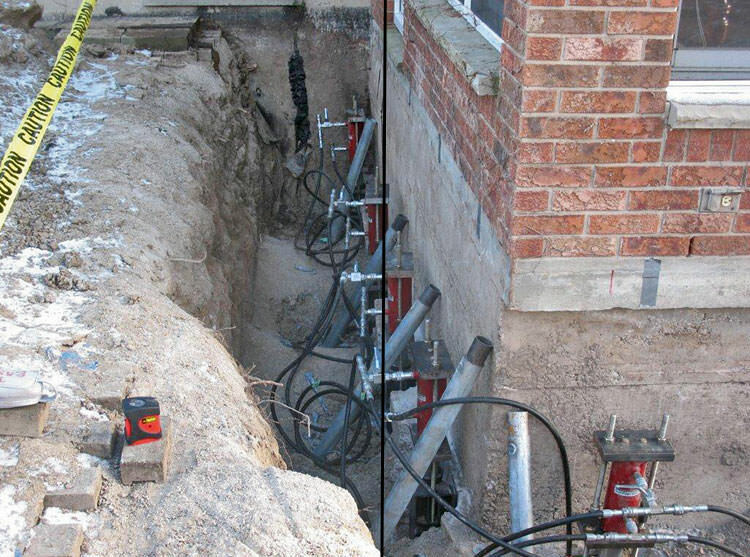 Solving this customers issue would include, stablizing and lifting perimeter foundation walls by installing our push pier system to the bedrock and to add additional steel where needed to support cracks in the foundation to spread to wall load. This customers residence is located in Berkeley,CA. Our customer came to us with concerns regarding sinking,cracking and trip hazards on his frontyard sidewalk. Through quick research they found us and set an appointment with our appointment center. Our strutcual consultant Sam Phelps, quickly came to evaluate their situation. This customers sidewalk has settling and cracking issues in the perimeter foundation. With installement of new concrete this sidewalk is now up to code and hazard free. Floors have become uneven. It's lower unit of two condo units about 900 sq ft size. Approx. a 8 X 8 foot section of my single car garage floor has become undermined by old drainage problem with up to 10" cavity underneath. Small 1913 garage just used for a shop, not parking of a car. The floor now slopes approx. 2-3". I bought my home and there is some seismic retrofitting that needs to be done. I need someone to come see and give me as estimate. Have garage space that is being converted into a small room and the existing concrete slopes. Need leveling. Looking for best, most economical way. We will be doing a Plan Set A retrofit of the cripple walls of our house in Berkeley. Would you be interested in giving us a price quote to do the work? I must replace the footer of a separated garage, replace its slab, replace one wall at rear of house and add some shearwall footer in the rear crawl space. I have AutoCad drawings from sketches provided and reviewed by an engineer. E-mail is the preferable way to reach me, initially. There is a crack in the foundation and I'd like to do an earthquake retrofit. Would like an evaluation of what the house needs to better protect it during a large earthquake. Have you noticed cracks in your foundation walls or floor? Do you have bowing walls or uneven concrete slabs in your Berkeley home? 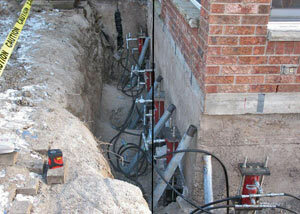 If so, foundation repair services from Foundation Repair of CA are the solution to your home needs. We provide a wide variety of foundation repair, concrete lifting and repair, and earthquake retrofitting options to address any problem you may have. As the local dealer of the international Supportworks network, you can count on us for industry-leading products and experienced, professional technicians. To fix all of your cracked concrete, we now offer NexusPro. Make your concrete look new again with our flexible and durable formula. We also offer SealantPro as a concrete sealant. It extends the life of your concrete by 3-5 times and protects it from stains and damage. The risks of earthquake damage are a consideration for all Berkeley homeowners, which is why seismic retrofitting is an essential process. By strengthening your foundation's weak points you will improve the overall stability of your home and allow it to better resist earthquakes. This upgrade provides you with peace of mind and improves your home's value. No matter what foundation repair or concrete repair needs you have, Foundation Repair of CA has a quality solution. Give us a call today to learn more about how we can help keep your Berkeley home looking and functioning great. We offer free estimates on all our work! This customers residence is located in Berkeley, CA and needed a new stem wall which at that time was cracked and disintegrating. The structural integrity of a building is maintained by a good foundation, the stem wall we installed is a major part of this system that holds a building in place. This customer is located in Berkeley, CA. Our customer noticed moisture in crawl space, Foundation Repair of CA encapsulated area using our CleanSpace liner and drainage matting. When there is heavy rain, some water seeps into the basement along the walls where the foundation meets the wall. The basement is generally damp so we are looking to properly waterproof the space to eliminate the minor flooding and dampness. I have a house in berkeley where we are making an addition in back. There is a bathroom on top on about 25 linear feet of 1-story foundation. I need to replace this with a two-story foundation and also put in another 15 feet of additional new foundation. If this is a job you are intrested in, please let me know and i can give you more detail. Hi, I would like some information and an estimate on a foundation retrofit for my house. It's concrete, most likely poured in the 70s, some detroration. Has about a 3 foot cripple wall without shear wall and not bolted. In correcting defective grade at the side of my home, the foundation has been exposed to the bottom of the T.
Settling along one foundation lines of house -3" from center of foundation.